A Shenandoah Sampler: Happy Independence Day!! Oh, how I have missed seeing everyone and reading all of your wonderful posts. Life has been crazy and focused on work, work, work. I have dearly missed everyone and am so glad to be able to poke my head in and say "Hello!" Hopefully you all are doing well, stitching like crazy and keeping cool! I look forward to catching up! As I mentioned, life has been crazy and I have been searching for some balance. What good is life if it all work and no play, right? I do have good news though...I finished the requirements for my teaching license and I received my official license in the mail just a few weeks ago. I have been madly filling out teaching applications and then hurriedly waiting for telephone calls. I have had some calls and interviews, so things are moving forward! Friday was a glorious day filled with fun, fellowship and a trip to my LNS. My dear friend Robin met me at my LNS, Cross Stitch Station. We talked, shopped, talked and shopped some more! It was wonderful being able to spend time with someone who is as excited about stitching as me! We both found some great stash...unfortunately, I did not snap a picture of what I found...guess I will have to do that next time! Believe it or not, I have had a *little* time to stitch over the past month and a half, but unfortunately do not have any finishes to report. Here is a snippet of what I have been working on. First, I was able to get about a third of Twenty Third Psalm done...now I am over half done! I was stitching one of the flowers a couple of days ago and thought my eyes were going to cross! I was stitching with the same color thread as the linen. Whew! Thank goodness the weather had cooled down because I had to go outside in order to see what I was stitching! If it had been 100+degrees like the past couple of weeks, that flower would have waited! Again, it is good to be back and I look forward to catching up with you all! Hubby is at work, but I am off to meet him and watch the fireworks! Stay cool and enjoy the holiday weekend! A big congrats on getting your teaching license. I hope you land a teaching position soon. Your framed pieces look fabulous. As always, I love seeing your progress on the Richmond Sampler. Your framed pieces are wonderful! I love your WIPs too! I'm taking the online class for the Richmond Sampler too -- I gave her the idea, I'm proud to say! I can't wait! Hope things are good with you despite the busyness! Oh, I am headed over to Essamplaire to find out about the online class - how wonderful as I have been green with envy over your pattern, lol. What lovely framed pieces and how fun to meet Robin and spend time shopping - she is such a darling, kind woman. Our fireworks were a little lacking this year, but we were surrounded by friends so it was a wonderful evening. Great WIP !!! Beautiful framed stitching ! Congrats on the teaching degree . Good Luck with job hunting ! Congratulations!! And interviews already! Isn't it great when things move forward? Oh, I have been debating about the Richmond Sampler class. I've enjoyed the pictures you've shared with us. Your stitching is lovely! Happy 4th! Valerie, Congratulations on getting that license, they very best of luck to you in landing your perfect job! Your framed pieces look incredible, you must be thrilled to have those hanging on the wall. So happy for you that you've had a fun day out in the midst of your busy life! I am glad you posted your framed pieces! As I said on Friday, both are gorgeous and you selected awesome frames for both! Richmond Sampler is even lovelier in person! You have made good progress on your Psalm piece! Friday was a blast and we need to do it again soon! Enjoy the coming week, Valerie! And remember to use that 'no' word at times! Fabulous finish, and WIP's. Welcome back to blog land! Valerie, welcome back and congratulations on your certification. Good luck with your job search and interviews. Congratulations on your teaching license. Such a wonderful accomplishment. I hope that you phone starts ringing off the hook with offers. I hope that life slows down for you too - it's definitely not fun when you can find for the things you love - like stitching. 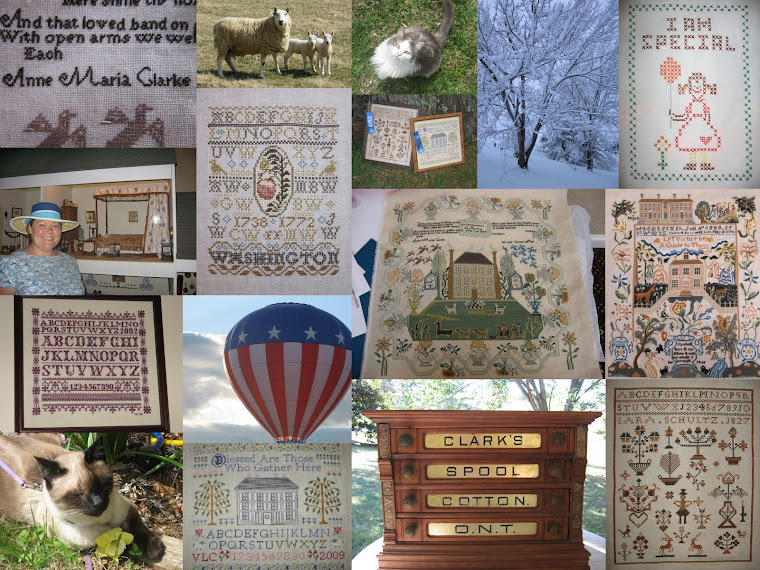 Your framed pieces are fantastic and I love your progress on the Richmond Sampler. It's going to be beautiful! Beautiful stitching ~ I especially love Sara Schultz...congrats on your teaching license and good luck on the job hunt! Your framed pieces are lovely! Good luck in your job hunt and congrats on getting your teaching license! Enjoyed catching up on your WIPs. Lovely finishes and WIP's! Good luck with your job search. I wish you much luck in your new career as a teacher. Your pieces are glorious! Love all the colors. Could you tell me who the designer is of The Lord's Prayer? Thanks so much.